Ramen Eggs are super easy to make and perfectly delish in a bowl of Ramen (you might want to see my Shortcut Pork Ramen made with my Vaguely Vietnamese Pork) or as a snack. 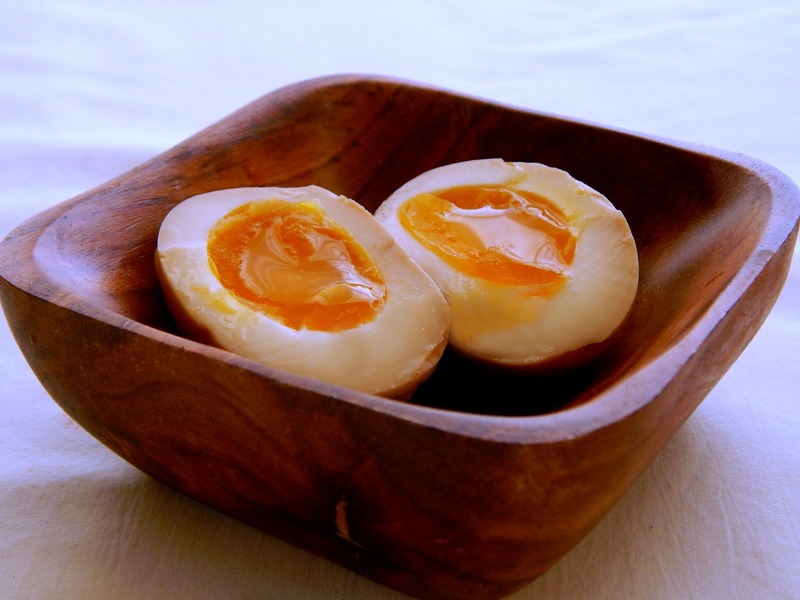 And while every Ramen House has their own secret blend, these eggs are a great starter recipe. What I like best about this recipe is that I use the same method I use to marinate other items – a Ziploc bag that can be pulled up and around your eggs so you can use far less of the sometimes pricey ingredients that go into your marinade. Marinade for four to 24 hours and viola! Ramen Eggs! Now aren’t you the boss! This recipe makes enough several eggs, and you can keep them for three or four days in the refrigerator. Combine soy sauce, dark soy sauce, mirin or mirin and sake, sugar and water in a plastic bag in a bowl. Stir together ingredients to dissolve sugar. Set aside. Bring water to a boil in a medium saucepan. There should be enough water to cover the eggs by two inches. When the water is boiling, take out the eggs from the refrigerator. Carefully, using a push-pin or safety-pin, gently poke a small hole on the bottom (fat end) of each egg. Quickly, so they’ll all be ready at the same time, but carefully submerge the eggs into water with a mesh strainer/skimmer or ladle. Immediately reduce heat to maintain a simmer and cook the eggs for the exact time to get the yolk you’d like. See timing, below. During the first two minutes, with a spoon or chopstick, gently spin the eggs. That helps the yolk stay in the center and helps the egg maintain an oval shape. When cooked for the desired time, immediately take out the eggs and soak in a geneously filled ice bath to stop the cooking. Let them cool for 3 minutes. Peel them very gently; they’re not completely hard. Add the eggs to the bag with the marinade and partially seal. Pull the bag up and around the eggs so all are submerged and close with a twist-tie, clothespin or rubber band. Seal the bag completely. Let sit in the fridge for at least four hours and up to 24, the longer the better. When ready to use, remove the eggs and toss the marinade. Serve, cut in half, by themselves or in a steamy bowl of Ramen. Timing for eggs; timing may vary depending on how high you are above sea level. For eggs that are custardy and soft, but not runny, cook 8 minutes. For eggs that are creamy and just a little liquidy yolk in the center, 7 minutes. For runny eggs, 6 to 6 1/2 minutes. May be very difficult to peel. I’ll be sharing this recipe on our very own Throwback Thursday Link Party as well as on Fiesta Friday. The co-hosts are Margy @ La Petite Casserole and Suzanne @ apuginthekitchen. It wouldn’t be Saturday without linking up at Saucy Saturdays blog hop! This entry was posted in Click here for Fabulous Food Posts and tagged Frugal Hausfrau, Japanese, ramen, Ramen eggs. Bookmark the permalink. Thanks for letting us know about the pinprick! How interesting. These sound so good. I love Ramen eggs. I’m kind of new to them, living in the Midwest of the US and all, but they were good! lol! That song is going to be stuck in my head all night, now! Gee, thanks!!! Thanks a lot for bring this nice idea to Fiesta Friday’s party! They’re fun and so good in the soup. A wealth of information on eggs Mollie, thanks. That pin prick sounds intriguing but I guess you get the desired results, I’ll have to definitely give that a try. Thank you. I wish I would have more than one egg left when I took the pic, but then, they don’t have to be perfect to be good! 🙂 I was cutting pumpkin bars with my Stepmom and joked, see food blogger have no imperfect bars as I cut them out of the center! Vanity! Ego! 🙂 Or maybe just challenge? So, when you pierce the eggs, and then boil them, the white wouldn’t stream out of them? Maybe because the holes are very small? And why do you have to pierce? I know, question, question…but I really want to try this!! Hey Angie! No, the hole is just the teensiest pinprick. And you know how sometimes there’s a little bubble of air in the egg and then your egg is all flat on the bottom? This takes care of that and supposedly they’re easier to peel. Gads, nothings worse to peel than a soft egg, lol!! Gosh, I know. I lived for a few years in the Colorado Rockies. What I missed most, I think, was that bread rose so fast that the yeasty flavor wasn’t as well developed! Have you noticed that? Maybe someday we’ll convert you, lol!